Notes: The Leadwing Coachman finds it's origins in the early 1820's as an offering from a carriage driver, Tom Bosworth, to his English Lord for fishing. 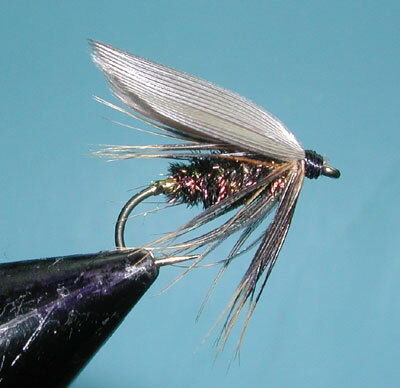 The original Coachman fly was a wet pattern of a peacock herl body, white duck quill wing, and brown throat hackle. Although wet flies found much interest during the early 1900's, they seem to have lost favor with most flyfishermen. The Leadwing Coachman can still be an effective fly, today. The wings were switched to a pair of Gray Mallard slips and a Gold wire tag was added to the rear of the body. The Peacock Herl body has proven to be popular as an atttractor with many patterns from the Zug Bug to the Prince Nymph. The best use for the Leadwing Coachman is during gray caddisfly hatches, particularly when the dry flies seem to be ineffective. 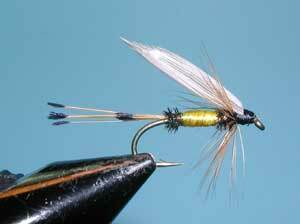 The Leadwing looks like diving caddis laying their eggs on the bottom of the trout stream. Other variations from this pattern include the Royal Coachman and the California Coachman. The Royal Coachman was first tied commercially by John Haily of New York in 1878 while he was employed by the Orvis Company and is probably the most recognized fly in the world. Mr. Haily received the prototype of the Royal Coachman from another tyer. The tyer was concerned that the peacock body was too frail and red silk in the middle was suggested to make the pattern more durable. Some Wood Duck fibers were also suggested for the tail. Mr Haily incorporated the changes but replaced the Wood Duck fibers with Golden Pheasant Tippet. After these changes were made, the pattern was recognized as the Royal Coachman. The California Coachman was designed by Mr. J.W. Fricke of San Francisco in the early 1900's and was published in A. Courtney Williams book, "Trout Flies" in 1932. It merely substituted the colors of the silk floss middle from red to yellow. 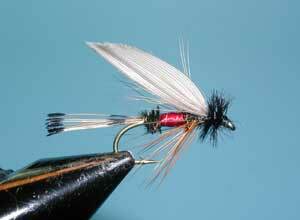 Most of these patterns had a later dry fly version using a catskill style.